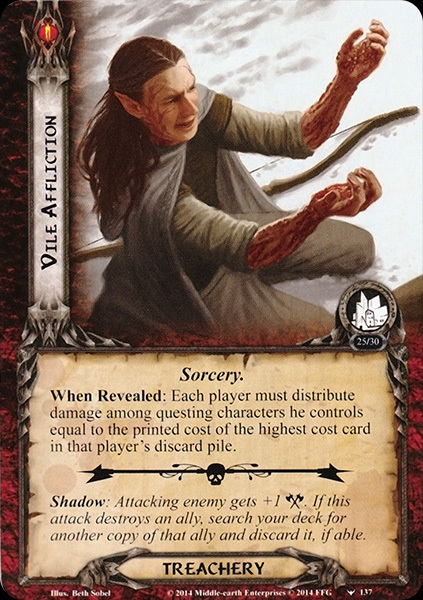 Play if: You want to prove your worth as a LotR: LCG player. You want to play an epic battle against orcs and undead. You want to face one of the toughest boss-enemies the game has to offer. Solo or multiplayer? : Solo is tough because you must both be a good quester and handle a lot of combat. But multiplayer causes additional encounter card reveal, increasing the chance of drawing sorcery cards. You will see why this is bad in a minute. Can I run side-quests for this scenario? : Don’t be daft. The first setup instruction is to add Thaurdir to the staging area, so let’s talk about him first. Thaurdir is a double-sided card, and you will probably see both sides of him throughout the quest. When he is first added, it is with his Captain side face up. He adds 4 threat, 6 attack, 4 defence and 9 hp. He is indestructible and cannot have attachments (but not immune to player card effects here – how lovely!). He adds +10 engagement cost to each other enemy, meaning that you won’t have to engage most enemies as long as he is on the Captain side. He has an engagement cost of 50 himself so you won’t have to optionally engage him. He also has more text, stating that when Thaurdir flips or a Sorcery card is revealed, you deal each enemy a shadow card. The flip-side of Thaurdir is the Champion side. Here he has the same stats, still indestructible and cannot have attachments, but now he gives enemies -10 engagement cost. So if you flip him, all the enemies in the staging area will now be coming down for a counter-attack. 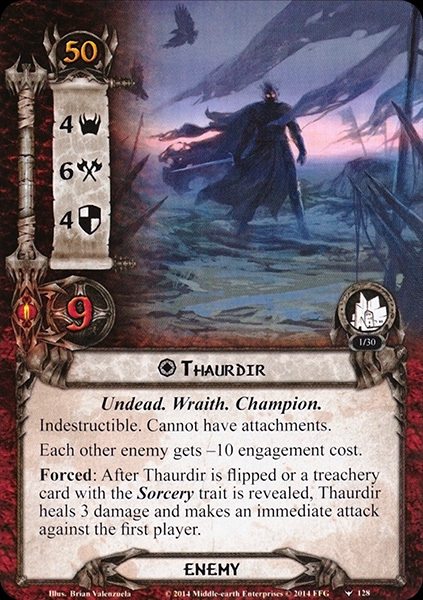 This side also has a nasty surprise – after Thaurdir flips or a shadow card with the Sorcery trait is revealed, Thaurdir heals 3 damage and makes an immediate attack against the first player. So whenever he flips, you have a 6-value attack to deal with, often accompanied by a bunch of shadow cards. Hope that defender you prepared is ready. Thaurdir can both flip from a quest card condition (we will get to that in a minute) and through encounter deck effects, so it is very likely that he flips. As you are under so much pressure in this quest, his 4 threat is also annoying. But, for now, let’s focus on the rest of the setup instructions. After Thaurdir has shown up to ruin our day, one copy of Carn Dûm Garrison pr. player shows up to ruin our day. At 1 threat, these are not much of a problem, but unfortunately they get +1 threat pr. shadow card dealt to them. And as Thaurdir adds shadow cards to all enemies every time a Sorcery card is revealed, this can escalate quickly. With 5 attack, the Garrison is no pushover – you need a chump or a dedicated defender (like Beregond with Gondorian Shield) to take an attack and survive. And keep in mind that most enemies here will have many shadow cards. With 3 defense and 5 HP you also need a lot of damage to take them out, meaning that they will likely stick around. Tactics Eowyn is a good choice for taking out the garrison right away. Lastly, a copy of Accursed Battlefield is added as the active location, which only requires 3 quest points, but which grants every quest card the Battle keyword. This means that until that is cleared, you quest with your attack instead of your willpower. But we are getting ahead of ourselves. Stage 1B also has a few tricks up it’s sleeve to ruin our day. The first text on card 1b states that Thaurdir cannot leave the staging area and cannot take damage. This basically means that you will have to deal with his 4 threat every round, which can put some serious pressure on a more combat-focused deck in true solo. Furthermore, if Thaurdir is Champion side face-up at the end of the round, he is flipped back to the captain side (meaning that his forced effect triggers, dealing shadow cards to each enemy in play, including Thaurdir himself). If there are 3 shadow cards dealt to Thaurdir, he flips. This will most often be from Captain to Champion, as the Champion side resets at the end of the round. Flipping to the Champion side will trigger an immediate attack, meaning that a fourth shadow card is dealt. And to clarify, Thaurdir ONLY flips when dealt EXACTLY 3 shadow cards (no infinite transition between the two sides). An attack from Thaurdir will most likely trigger multiple shadow card effects, and you do not want that to happen! Finally, unresolved shadow cards are not discarded from enemies at the end of the combat phase, meaning that they accumulate. 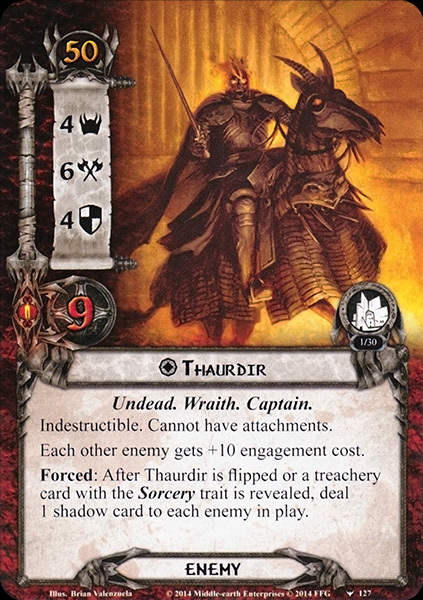 Remember the text on Captain Thaurdir – every time a Sorcery card is revealed, you will deal a shadow card to each enemy, meaning that you only have to reveal three Sorcery treacheries before Thaurdir flips… It also means that it is highly dangerous to leave enemies in the staging area, as they may accumulate shadow cards, and when they finally come down swing for a huge attack with multiple shadow effects. So to summarize the board state, we begin stage 1b with 4+X threat in the staging area (X is player count) and first quest phase will be combat questing. 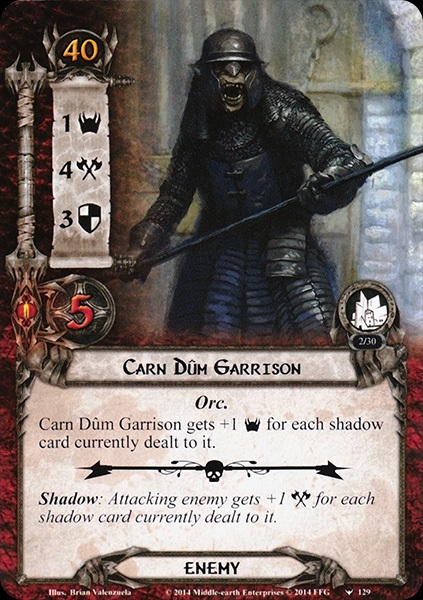 You are almost guaranteed to add more threat, as all the Sorcery treacheries will give the Carn dum garrison +1 threat, as they are dealt a shadow card by Thaurdir. As discussed below in the location section, you have multiple 3 and 4 threat locations that can cause an immediate location lock. You only need 3 quest points to clear the active location, accursed battlefield, but as mentioned above, the Battle keyword causes it’s own problems because it requires you to quest with your fighters, that you would like to use against the garrison before they accumulate too many shadow cards. This shift between Battle questing and normal questing is brutal in true solo because it requires you to be strong in both stats. If you are all about willpower, you will never get out of the first location. And if you are all about battle, you will be stuck after. Remember, you begin with 5 threat in the staging area, plus whatever the encounter deck decides to throw at you. You may need to quest for more than 10 attack power if you want to be able to clear the battlefield on the first turn. In my Carn Dum runs, I found it necessary to clear the battlefield as fast as possible, to keep the staging area as clear as possible. Swarm/speed decks are crucial here, as a slow deck will be run over before it builds up a board state that can handle the enemies and locations. Dwarves, Gondor, A Very Good Tale decks, Caldara are all good suggestions. Ideally, you want to clear the active location and possibly engage the Carn Dum garrisons if you can survive the attack. For the first round or two, some cards are definitely better than others. Several of the sorcery treacheries (discussed below ) can whiff in the first rounds before players have cards in their discard piles, so it is always good to see those at this early stage (even though they add shadow cards). Otherwise, you can hope for a nice 2 threat location or even another Carn Dum garrison. In true solo, you can easily get a turn 1 board state that shuts you down, and in multiplayer you can get a Thaurdir attack in the first round. It can be a very fickle quest, but if you survive and get out of the battlefield, you might stand a chance. You need 15 quest points to proceed. This can be tough, as you likely want to clear locations as they appear. However, several of the locations punish you with hard travel costs or terrible effects when active, and location control is therefore a very good idea. Tactics Legolas is an obvious choice here, as he can chip away at the active location when he kills an enemy. Asfaloth and the Evening star are also handy to remove locations in the staging area. And Thror’s key can blank them, bypassing the nasty active location effects. The most important thing is to keep the staging area as clear as possible. if you allow multiple enemies to accumulate, you will find yourself run over if Thaurdir suddenly flips. Keep your defender or a chump blocker ready for him, as he can flip from treacheries. Otherwise you should aim to keep the staging area under control. If you can place 15 progress and survive all the enemies, locations and treacheries, you will proceed to stage 2A. There is one way to tech Carn Dum, which was first described by Seastan in this youtube video. As unresolved shadow cards are not discarded, this means that enemies with attached forest snares will never attack, and will therefore just accumulate cards throughout the game, giving you time to build up your board state. If you can stall the game long enough, you can actually trap the whole encounter deck on snared enemies! However, stage 2A punishes you for that. When revealed, each player raises his/her threat by the number of shadow cards in play, which can be huge if you have many enemies in the staging area. If you pursue the forest snare route, this will likely threat you out. 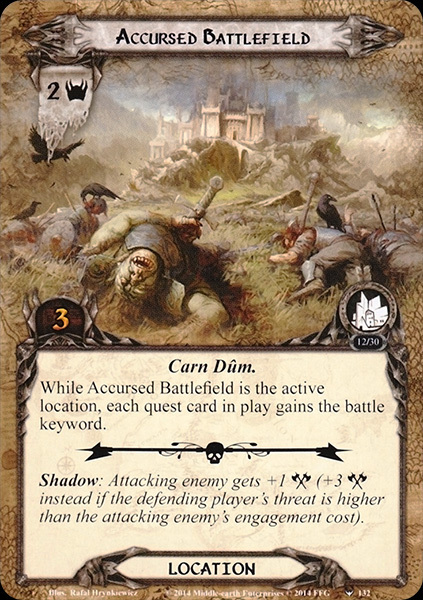 However, the Carn dum pack itself came with a build-in tech against that, providing us with the rarely-used Favor of the Valar, which will bounce your threat back to 45. After the threat increase, Thaurdir will flip to his Champion side if the captain side is face-up, meaning that you have to take an attack from him. If you survive this, it is time for the final showdown against Thaurdir. Thaurdir cannot leave the staging area (so he still contributes his 4 threat), but is considered to be engaged with each player, and attacks each player during the combat phase. If the captain side is face-up, he will flip back, causing an immediate attack. When the quest card has 15 progress, Thaurdir loses indestructible, and when he is defeated, you win the quest. So you need to quest hard, withstand repeated attacks from Thaurdir, and deal him sufficient damage to defeat him. This trifecta of victory conditions once again forces you to strike a perfect balance between questing, defense and attacking. To deal with attacks from Thaurdir, you probably want a dedicated defender. Chump blockers can work, especially if your dedicated defender starts taking damage. You will have to take at least one attack pr. round – remember Thaurdir’s Forced ability: every time a Sorcery card is revealed, he will attack the first player. A Beregond with Gondorian shield can take a hit with no shadow effects, but you need healing as well if Thaurdir gets attack bonuses. Several shadow effects can grant nasty attack bonuses or additional attacks. Angmar marauder is your worst nightmare in this regard, granting +1 attack for each ally the defending player controls, which can wreck a strong defender. That alone makes Hasty stroke or A burning brand recommendable. 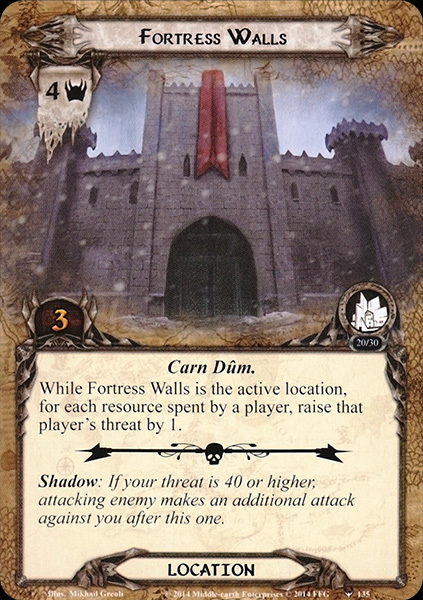 Fortress walls gives additional attacks, Daechenar’s will flips Thaurdir (dealing shadow cards and an additional attack when he flips back) and Carn Dûm Garrison grants +1 attack pr. shadow card dealt. All of these shadow effects can wreck your defender strategy, cost you a hero or force you to chump block additional attacks. You should therefore always keep allies ready for a surprise attack. Another problem is that if you dedicate Beregond to take attacks from Thaurdir, you still need a backup plan for the other hard-hitting enemies. Angmar Captain attacks for 5, and punishes you for chump blocking. The Werewolf of Angmar also hits for 5 and Carn Dûm Garrison hits for 4. When Thaurdir is in champion mode all of these enemies have -10 engagement cost, meaning that you will likely have to face them rather than leave them in the staging area. A Feint or a Grimbold can, therefore, save you and let you survive another round. Back in the day, a Boromir with Blood of Numenor could take all the attacks in the world, but times have changed and new solutions must be found. A good tip is to include Armored destrier on Beregond, as it allows you to ready him (making him available for several defenses) and at the same time remove nasty shadow cards. Of course you can grant him lore and slap on a burning brand, which will remove all shadow card problems. But overall, the best thing you can do is to be fast. Make sure you do not advance to this stage before you feel confident that you can quest through and deal Thaurdir the required damage. The faster you can do this, the fewer attacks you need to take. Now that you have found a strategy for defending Thaurdir’s attacks, you need a strategy for placing 15 progress on the quest. The requirement for progress is the main reason why I recommend that you keep a clear staging area as much as possible during 1b. If you reach 2b but have a bunch of enemies and locations, you will first of all be curb-stomped by enemies (due to the decreased engagement cost) and possibly be location locked due to the repeated attacks from Thaurdir, which may keep costing you allies. So a clear staging area is a good staging area! Travel to locations (or clear them with location control), engage enemies so you can quest hard. As Thaurdir heals every time a Sorcery treachery is revealed, it is usually better to spend resources on questing than to hold back characters for attacking. If your board state is good, it shouldn’t take too many rounds to place the 15 progress. Now it’s time for attacking. As Thaurdir has the capability to regenerate quite a lot (due to flipping or sorcery reveals) it is recommended that you take him out in one alpha-strike. A powered up Beorn, a Gandalf with flame of arnor, or some of the various attack power boosters are all recommended. Best case scenario, you have a range of allies ready to jump on him the moment you palce the 15th progress. The reverse can work too (deal damage and then yolo quest) but then you are at the mercy of the encounter deck, which is generally an undesirable position to be in. Quest hard, fight hard and with a little luck, you will emerge victorious! The encounter deck is pretty thick in this scenario, containing 45 cards in Normal mode. This does get slimmed down to 29 in Easy mode. The chances of getting a shadow effect are really important in the quest. In normal mode, 78% of cards will have a shadow effect, this gets raised to 83% in Easy mode. Remember that Mountains of Angmar will make this 100% by adding a shadow effect to cards that don’t have one. Average threat on cards revealed is similar in both modes, averaging in on 1.4 threat/card. This ranges from 0 to 4. Surge is very common in the scenario, being on 8 cards in the encounter deck. Doomed is less common, but still on 6 cards in the encounter deck. This scenario tends to build players’ threat up quite quickly, so be careful with bringing doomed cards of your own. Quest card effects give Thaurdir other immunities. These stats do not count Thaurdir, the first Accursed Battlefield and one coy of Carn Dum Garrison, as those cards are always in the staging area or the active location at the start of the game. Overall, the encounter deck is pretty heavy on enemies and treacheries, though it should be stated that shadow cards in play can skew that distribution a little. I have already covered Thaurdir in detail in the sections above, so I will not dwell more on him here. It is worth looking at the enemies you will run into to plan a strategy around them. I will also discuss shadow effects in more detail than usual, as so many shadow cards are dealt in this scenario. Orc Grunts are a rather small nuisance, but can cause you a lot of grief when they appear at an inconvenient time (and in Carn Dum it is ALWAYS an inconvenient time!) Doomed 1 and surge is annoying, and they take 4 attack power to kill, meaning that you have to allocate some of your offensive power to take care of them. They have a forced effect that tries to stall you, subtracting one from any progress placed on the current quest. As they have a rather low engagement cost (8) you will usually have to engage them right away, even when Thaurdir is in Captain mode, this will mostly matter if you cannot kill them straight away. Their shadow effect is also annoying, adding the grunts to the staging area. This means more threat, and a guaranteed enemy next round. The best thing you can say about this shadow effect is that it pulls a surge card out of the deck. Overall, this enemy is not much a threat but can stall you and direct resources away from the beefier enemies. 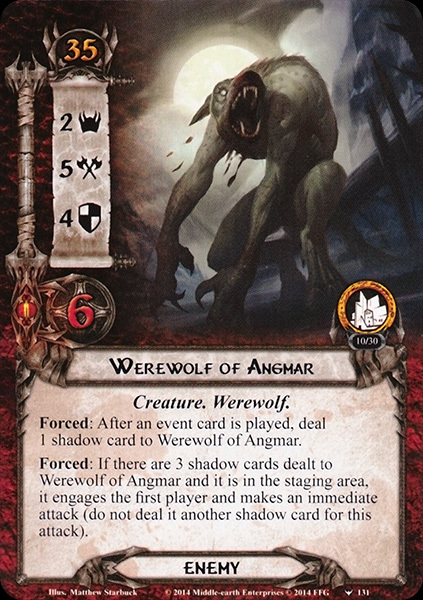 Werewolf of Angmar is almost a mini-boss in itself. 2 threat makes it tempting to leave it in the staging area, and an engagement cost of 35 makes that possible when Thaurdir is in Captain mode. It has 4 defence and 6 hp, making it hard to kill in one go. And 5 attack is no joke if Beregond/Denethor/Boromir is not powered up yet. But it is dangerous to leave the werewolf around. Whenever you play an event card, you add a shadow card to the werewolf. And whenever the werewolf is dealt a third shadow card and is in the staging area, it makes an immediate attack against the first player (without getting additional shadow cards). This means that you may have to consider whether it is truly worth it to play that Test of Will and face an enemy that attacks for a minimum of 5. In stage 1B it will easily get to 3 shadow cards, meaning that you have to deal with this enemy. Feint it or chump block it, and pile on attackers. Mercifully this card does not have a shadow effect, and you will, therefore, be glad to see it as a shadow card. Angmar Captain makes a return and is another mini-boss in the scenario. With 5 attack, and the ability to chain-attack if he destroys allies, he is another reason to have a super defender out. 3 threat means that it is tough to leave him in the staging area, but it can certainly be done – when Thaurdir is in Captain mode, his engagement cost is 45. He also packs a modest 2 defense/5 HP, making him easier to deal with than the werewolf. If he arrives at an inconvenient time, he can wreck your board state. It is nice when he can be trapped with Ranger spikes, or you can Feint his attacks. He is another card that you will be happy to see as a shadow card. As discussed above, the most dangerous aspect of Angmar Marauder is his shadow effect, which means an almost certain hero loss unless you are playing an ultra-Voltron deck. His stats are by no means weak, and an attack of 3 means that you have to dedicate a decent blocker to survive it. Furthermore, he punishes chump blocking, as this returns him to the staging area. 2 defence and 4 hp mean that you need to dedicate several attackers to deal with him. However, I always prefer to see this guy in play, rather than seeing him as a shadow card, unless I can cancel that card. Angmar Orc is perhaps the weakest of the bunch (with the exception of the grunts) and is more a nuisance because they wreck your board state. The when revealed effect causes you to either reveal an additional card or discard an ally. Revealing additional cards is super dangerous, as it could be sorcery or a Werewolf, or a high-threat location, so you most often need to take it on the chin and discard an ally. This means that it is good to have low-cost allies around that still offers utility (Stargazer, Master of the Forge, Warden of Healing), so the Angmar Orc doesn’t cost you a Jubayr or a Glorfindel. Stat-wise he is rather weak – 2 threat and 2 attack shouldn’t cause too much trouble. However, he has 3 defence and 3 hp, which means you cannot really chip away at his health as easily as the others. He is also a good candidate for Ranger Spikes or Entangling Nets. His shadow effect grants +1 attack and returns the attacker to the staging area if the attack destroyed a character, once again punishing chump blocking. Locations are few, but generally quite tough. Generally they all come with nasty effects, but some of them are even nastier as shadow cards. The Accursed Battlefield is the first location you will see. As we discussed earlier, this quest is combat heavy, and it can, therefore, be very inconvenient that you suddenly have to dedicate your attackers for questing. With 2 threat, it is a location that you can leave in the staging area, and ping it with Asfaloth or The Evening Star. when your board state is well-established, you might be able to travel to it. If you run a strong tactics deck, it might be beneficial for you to make one of these active from time to time. I definitely prefer to see it on the table rather than as a shadow card – +1 attack, and +3 attack if your threat is lower than the enemy’s engagement cost. In stage 1B, this will most often be the case, and it can, therefore, cause a nasty surprise for you, especially if it is one of many shadow cards. Mountains of Angmar is in many ways a tough location. High threat (3) and many quest points mean that you might not be able to clear it in one questing phase, which increases the risk for location lock. Furthermore, it has a tough Forced effect when it is active: All blank shadow cards gain “Raise defending players threat by 2”. When Thaurdir attacks you with 4 shadow cards or you finally decide to pull down a Garrison with multiple shadow cards, this can be back-breaking. I would argue that it is worth it to gain 5 threat through Heirs of Earendil to remove it or target it with Asfaloth if you have enough questers to take the 3 threat for a couple of rounds. The shadow effect raises the defending player’s threat by 2, which is most often a minor inconvenience. Blight of Carn Dum is another prime target for location control with only 3 quest points. 3 threat is not insignificant, but depending on the board state, the travel effect can be brutal. To travel there, you deal one shadow card to each enemy which can be catastrophic if Thaurdir has two already. However, the Forced effect heals one damage from an enemy every time it attacks, meaning that you can’t afford to ignore it unless you can one-shot all enemies. Whether you can afford to travel there is something you have to judge based on the board state. If Thaurdir is the only enemy and he has no shadow cards, it is generally worth taking the risk. If you are a strong quester, quest over the three threat. As a shadow, it only punishes you if the attacking enemy is Thaurdir, healing him 3 hp. This is generally not a problem, as you will likely wait until the very end to attack him. Fortress Walls is one of my least favorite locations in the game, due to a combination of high threat (4) and a brutal Forced effect. A solo reveal of Fortress Walls first turn usually results in a scoop. The high threat means that you cannot ignore it, and the Forced effect makes it risky to travel there unless you are absolutely certain that you can clear it the following turn. While Fortress Wall is active, each resource spent by a player increases that player’s threat by 1. As you constantly need to play cards to keep up with the pace of the Battle, this is a major setback, and can cause your threat to increase by a lot if you have to stay there. Location control is highly advised. A well-placed Thror’s Key can do wonders here, as can the new Woodmen’s Path. As a shadow card it can either make you sigh with relief or groan in anguish. If your threat is below 40, nothing happens. If it is 40 or higher, you will get an additional attack. By now it should be pretty clear why that is bad. The interaction between Thaurdir and Sorcery cards is an interesting spin on the Treacheries, taking them out of the vacuum where they don’t really interact with the board state. A lot of the treacheries here are either hit or miss. In the early game, some of them can actually whiff without surging, whereas late game they can break you. And of course, they buff enemies through shadow cards and can trigger Thaurdir’s merciless attacks. As a matter of personal taste, the sorcery cards also features some of this author’s favourite art of the cycle. Terror of the North is the first sorcery treachery on the list, and can really foil your plans for blasting through the active location. It causes you to discard the top 3 cards of your deck, and add 2 threat for each card type discarded. 2 extra threat might be negligible, but 4 or 6 can cause a severe setback. Furthermore it combos nastily with some of the other sorcery cards. As a shadow card, it is either moderately bad (+1) or severely bad (+2 or +3), depending on what three cards you discard. When given to Thaurdir or the Werewolf, this can wreck a lot of buffed-up defenders. Dark Sorcery is a card that has cost this author victory more than once. It has Doomed 2 and causes you to discard each ally which has a copy in the discard pile. In a Caldara deck or late game, this is absolutely brutal and can clear your board. This is the treachery you hope to see on turn 1, as it will only add 2 threat. As a shadow card, it punishes chump blocking, by forcing you to discard the defending character if there is a copy in the discard pile. Keep in mind that this can also make short work of defender allies, like Gildor Inglorion and Jubayr if you discard your extra copies. It is conditional but is terrible under the wrong circumstances. It is generally worth saving a Test of Will for. The discard pile hate cards make Will of the West a good inclusion in your Carn Dum deck – if your discard pile becomes too big, you can reset it. Heavy Curse has surge, which is bad in itself, as it can surge into another sorcery, dramatically increasing the chance of a surprise Thaurdir attack. It is a condition attachment, attaching to the current quest, adding one to the cost of cards if there is a copy in the owner’s discard pile. It combos with Terror of the North, and punishes Caldara/Very good tale/chump blocker strategies. It has no shadow effect, and is therefore a card you hope to see during combat. The Sky Darkens is another Sorcery card that is also worth saving a Test of Will for. It forces you to discard a card, and search your deck for all copies and discard them as well. Outside of very specific situations (card targets Elven Light, or a spirit card when you have Dwarven Tomb or Stand and Fight) this is bad. If you have built your strategy about certain combo pieces, it can take it all away. The shadow effect forces you to discard a random card, but without the fetch effect, and is therefore preferable to the treachery itself. Vile Affliction is the final sorcery card, and can wreck your board state if you get it at the wrong time. It forces you to deal damage among the questing characters equal to the value of the highest-costed card in your discard pile. This is obviously a problem if you run Gandalf, if you run Caldara or if you are unlucky with your Terror of the North effects. However, it is a conditional effect, and usually you can work around it, and assign damage among questing heroes. It is therefore one of the mildest sorceries you can get. The shadow effect grants +1 attack, and if the ally is destroyed, you have to search your deck for another copy and discard it. This can be annoying, but will most often punish you for chump blocking. Daechanar’s Will is the only non-sorcery treachery in the quest, but its effect is bad enough without. When it is revealed, you flip Thaurdir. And if he now has captain side face up, he gains surge. This means you either get a range of shadow cards and an additional encounter card or a surprise attack from Thaurdir. It is prime A test of will material, as it is an effect you cannot really allow to resolve unless you are in a very good board position. Remember that depending on the quest stage, he might flip back again. The shadow effect also causes Thaurdir to flip after the attack, meaning that the same problems apply. It is worth packing shadow cancellation for. Because the quest is so difficult, a side quest can often mean that you have to reset the game. The effects can be brutal, and make an impossible situation seem much worse. On the positive side, the side quest do not have shadow effects, meaning that you are extra happy to see them during combat. Orc Ambush makes a return, buffing each orc enemy with +1 threat, attack and defense. This includes the Carn Dum garrison which will now swing for 5. Good luck. Additionally, each player must search the deck and discard pile for an orc enemy and put it into play engaged with him/her. A good target for this is Angmar Orc as you can bypass his when-revealed effect. This is a side quest you have to deal with. It is only 4 quest points, so it is hopefully manageable. The Power of Angmar has surge, and requires 8 progress to clear, which is a significantly larger investment than Orc ambush. While Power of Angmar is in play, cards cannot leave your discard pile. Depending on your strategy, it may not mean anything, but in a Caldara deck, or a deck that runs Elven Light, this can be a major setback. If you manage to clear it, you get to shuffle the top 5 cards of your discard pile back into your deck. Whether you should clear this or not is highly conditional. If you run Noldor or Caldara, you likely have a lot of questing power, and can therefore probably spare the resources to clear it. If you do not care about your discard pile, let it be. 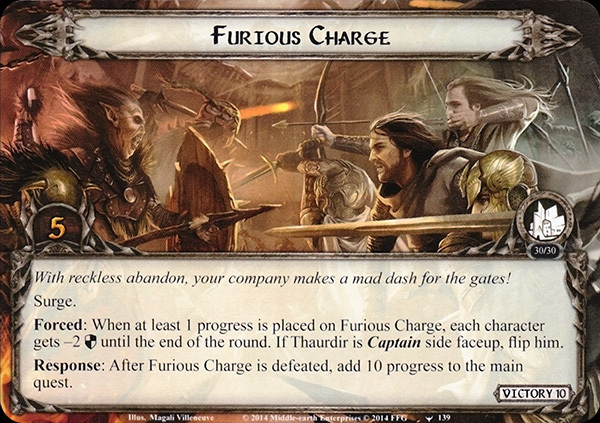 Furious Charge is a thematic home-run, allowing you to make some serious progress, but at high risk. It has surge, and requires 5 progress to clear. When it is defeated, you add 10 progress to the main quest, which can often place the final progress you need to advance or to face Thaurdir for the final time. However, it comes at a cost. When you place progress on this quest, characters get -2 defence until the end of the round (they are charging after all) and Thaurdir flips to his Champion side, symbolizing that you face him on the battlefield. However, you will likely save this side quest for the final push, meaning that he is hopefully with his Champion side face up already. It is a quest that you need to take in one go, as the decreased defence will make short work of your defenders. If you use this to place the final progress on 2b, then you can save more characters for the final combat against Thaurdir. And then you have won a highly thematic victory. Hit the ground running. You need to quest for a lot and fight a strong enemy right out of the gate. Caldara, Dwarf swarms, Vilya decks, all of those are good strategies for establishing an early board state. Build a dedicated defender. Even though shadow effects can wreck you, a strong defender with Gondorian Shield or Blood of Numenor can really make your life much easier. Chump blocking can only take you so far, and you cannot afford to lose characters every round. Beregond, Denethor, Spirit Dain, and Thranduil are all good candidates. Think long and hard about what restricted attachments you will use, and be sure to consider some shadow cancellation. Don’t be afraid to scoop. A turn 1 Fortress Wall or Werewolf in true solo is a board state you will have a very hard time advancing form. Cut yourself some slack, and allow a reset for a better opening. Pack combat tricks. Thaurdir is not immune to player card effects. This means that he can be targeted by Feint, feigned voices or Grimbold’s ability. Giving yourself a round of breathing space can really make a significant difference. These are also good techs for Angmar Captain and that bloody werewolf. Thaurdir can also be targeted by direct damage effects. A well-timed Gandalf bomb can be used to take him down once you have placed sufficient progress. As the treacheries and severe attacks will likely cause you to lose allies as the game proceeds, this extra damage can make the difference between life and death. Remember that Forest snare can be tempting, but don’t forget to include Favor of the Valor if you go for a turn 1 or 2 capture. Otherwise your threat will raise a lot once you go to stage 2. Snare with care! Remember cancellation effects. If you want to stay on top of things, you have to take out the nastiest effects of the encounter deck. Likewise, location control can be a godsend. Seastan’s minimum purchase demonstrates how the forest snare strategy can be utilized to cheeze the quest. He uses a deck composed of only core and carn dum cards, and runs it in easy mode. Warden of Arnor also did a playthrough in his progression series. And finally Seastan demonstrated the power of the One Deck by beating nightmare Carn dum with it.